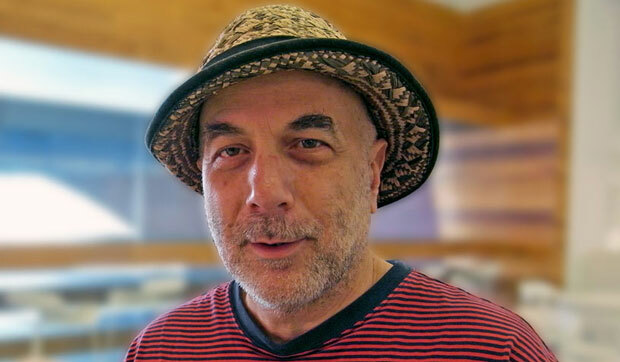 Ron Arad was born on April 24, 1951 in Tel Aviv. He attended the Bezalel Academy of Art and Design in Jerusalem, and in 1973, he moved to London and enrolled at the Architectural Association, where he continued his architectural studies under the guidance of Peter Cook and Bernard Tschumi. He graduated in 1979, and in collaboration with Caroline Thorman, he established his own design and production company, One-Off, in 1981. One-Off produced iconic works by fusing together partially ready and ready-made pieces. In 1983, they launched the One-Off Showroom in Convent Garden. Some of the early celebrated works by Arad include the remarkable Rover Chair, which was produced by joining together two ready-made pieces, a scrap yard seat of a Rover 200 fused with a frame of Kee-Klamp scaffolding. Other products such as the stereo cast in concrete produced in 1983, and the Tinker chair made by beaten steel, took over the London public of the 80s by rage, the people, overindulged in the spirit of post-punk nihilism and harsh individualism, took a deep fascination to Arad’s methods of fusing used scrapes of materials, and that demonstrated to them, an escape from the infestations of urbanism. In 1989, he merged One-Off to form the Ron Arad Associates architecture and design practice. During the 90s, Arad devoted his time to develop new ideas using welding, beating steel, forging materials to form rigid and rough shapes, such as the volume chair produced in 1988, the Big Easy, that was made by sheets of bent and welded steels using the techniques of polishing metal and welding. In 1994, Arad established the Ron Arad Studio, design and production unit in Como, Italy. Arad has done considerable work experimenting with various materials such as steel, aluminium or polyamide, and the development of brutal forms and structures of furniture. His unique and artistic designs have firmly established his position as leading designer and artist in the world of contemporary architecture. Alongside his work at the studio, Arad’s services are hired by several leading international companies such as including Kartell, Vitra, Moroso, Fiam, Driade, Alessi, Cappellini, Cassina, WMF and Magis among many others. In 2008, he established Ron Arad Architects, and in addition to that, he has served as the Professor of Design Product at the Royal College of Art in London from 1997 until 2009. He has done a number of museum shows, including the widely popular and highly praised “No Discipline” tour, which opened at the Centre Pompidou, Paris, and later also opened at the MoMA, New York, in 2010. Another one of his highly successful and critically acclaimed shows is the “Restless”, which opened at the Barbican Centre in London, in 2010. Arad’s work graces private and public collections all over the globe, it is primarily displayed at the Metropolitan Museum of Art, New York and the Victoria and Albert Museum, London. He has also designed a number of Public Art pieces, including the Kesher Sculpture placed at the Tel Aviv University, and the Vortext, displayed in Seoul, Korea. Ron Arad was awarded the Royal Designer for Industry (RDI) for his “sustained excellence in aesthetic and efficient design for industry” in 2002, as well as the London Design Week Medal for “design excellence” in 2011. In 2013, he was made a Royal Academician of the Royal Academy of Arts.